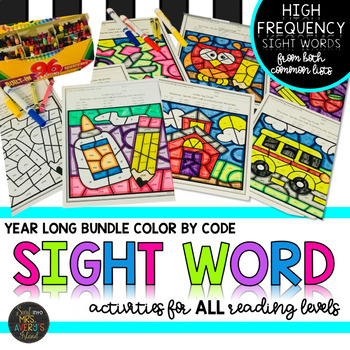 Do you have students who struggle with reading comprehension simply because they have not mastered their sight words? Teaching, practicing, and mastering sight words for all grade levels are the key components to increasing reading fluency and reading comprehension skills! 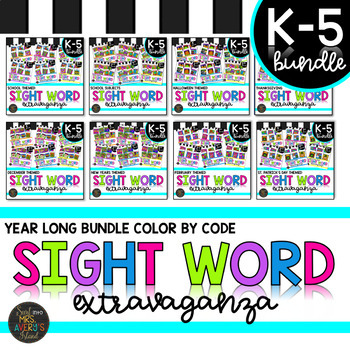 This year long sight word bundle will provide you NO PREP, DIFFERENTIATED printables for the ENTIRE year... GET READY BECAUSE YOUR STUDENTS WILL FALL IN LOVE WITH THEM AND BEG YOU FOR MORE AND MORE, but no worries...I've got you covered for the ENTIRE YEAR! ❤️ "I am going to have these as "transition work" for when my groups come into my room so they can get started right away while I transition from one group of students to another. (I teach K-5 EL so am a revolving door.) I love that there are differentiated options for each grade level!" - Laura S.
❤️ "I absolutely love this bundle! I plan to use this resource as part of my RTI rotations and for my early finishers to keep them busy. The best part is my students love it." 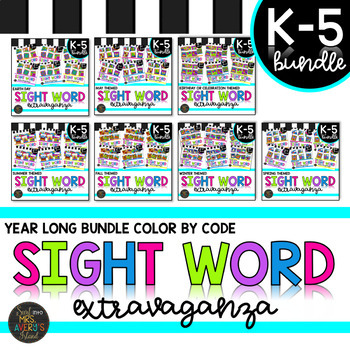 - Maegan S.
I invite you to click the links below and check out what is included in this Sight Words Color by Code YEAR LONG MEGA BUNDLE! 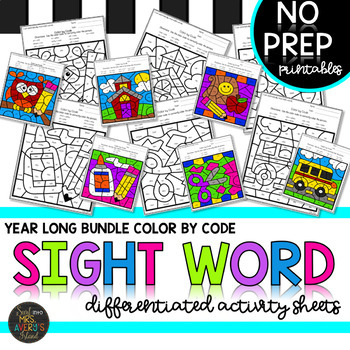 You will quickly discover the ease of integrating these no prep printables into your ELA/Reading lesson plans as well as highly engaged students begging for more "fun sheets"! CLICK HERE to subscribe and receive my newsletters. You will be the FIRST to know where to grab my FREEBIES, how to enter my GIVEAWAYS, and SPECIAL PROMOTIONS!